Welcome to Ndani TV on NOTV. Ndani is Swahili for ‘inside’ and represents our one singular proposition: to take you inside Africa. From Kenya’s own Silicon Valley, the beautiful South African coats, to Nigeria’s vast entertainment landscape, let Ndani take you on a journey into the depths of Africa, unveiling the beauty inside. Discover the best of Africa’s neo soul on Ndani Sessions. On The Juice, Toolz interviews the hottest names on the African music scene and the continent’s future business tycoons share secrets learnt on their challenging, yet rewarding journeys to success and recognition on Young CEO’s. 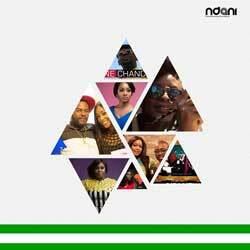 Ndani will feature the best of New Nollywood as well as the classics. With exclusive interviews and backstage access to Africa’s largest fashion events, features on the continent’s most beautiful destinations and the most exciting sport interviews and analytics, Ndani TV will be the purveyor of Pan African taste and the #1 online destination for premium African business, entertainment and travel content. The views and opinions expressed in these videos are those of the artist(s) featured, and do not represent the views of Ndani TV.